Never in my wildest dreams could I have imagined spending a Valentine’s Day on a beach with not one, but two, well-dressed men. Well-dressed for the Arctic, that is. Because that’s what Point Lookout in Maryland felt like on this Valentine’s morn. 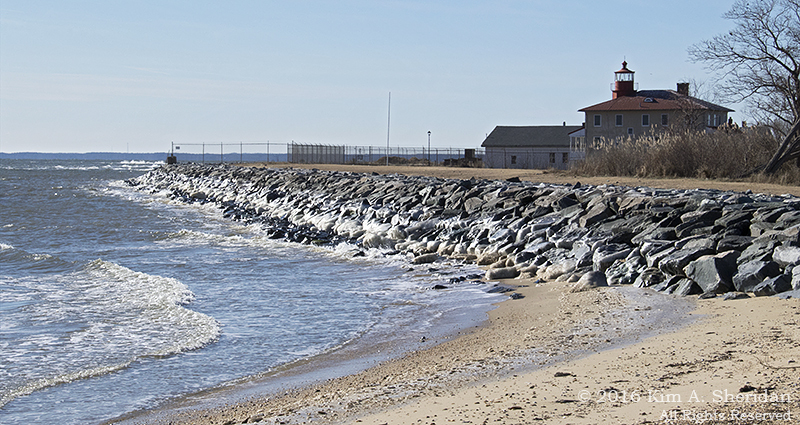 Robb, Don and I had come to the western shore of the Chesapeake Bay mostly to look for the fossils of Calvert Cliffs. Never ones to pass up a lighthouse, though, we drove to Point Lookout State Park at the very tip of the peninsula between the Chesapeake and the Potomac River. 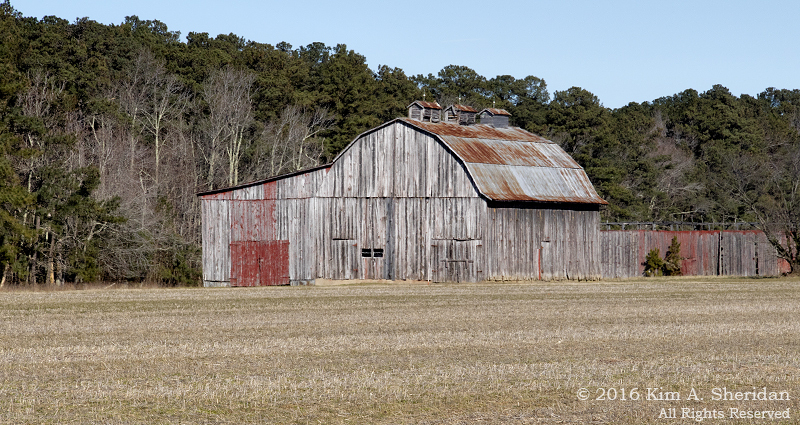 On the way, we passed a weathered wooden barn at the edge of a slumbering winter field. My companions couldn’t resist a little tomfoolery. Don decided we should reenact an Andrew Wyeth painting, and made Robb lie down and pose in front of the barn. Laughter is the best medicine, and these guys keep me laughing all day long. We found the lighthouse unimpressive, spoiled as we were by Drum Point the day before. 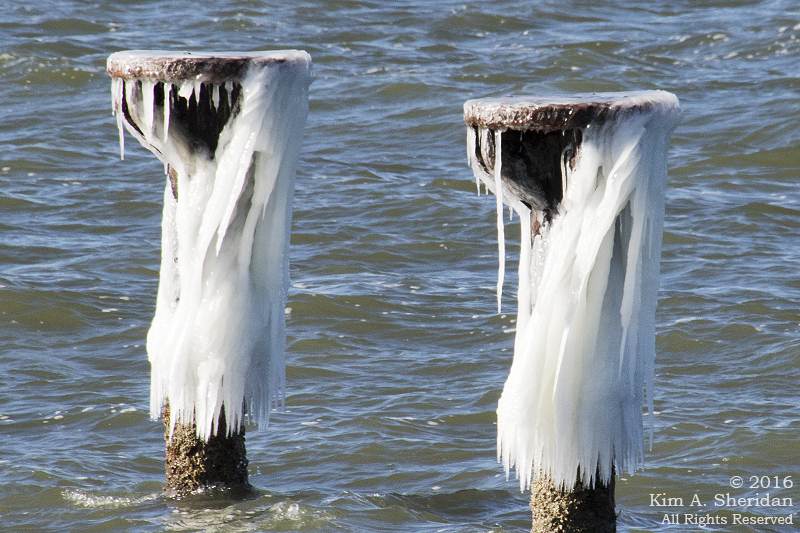 I was more intrigued by the ice coating objects along the shoreline. Not sure what these are. Can you guess which way the prevailing wind blows? 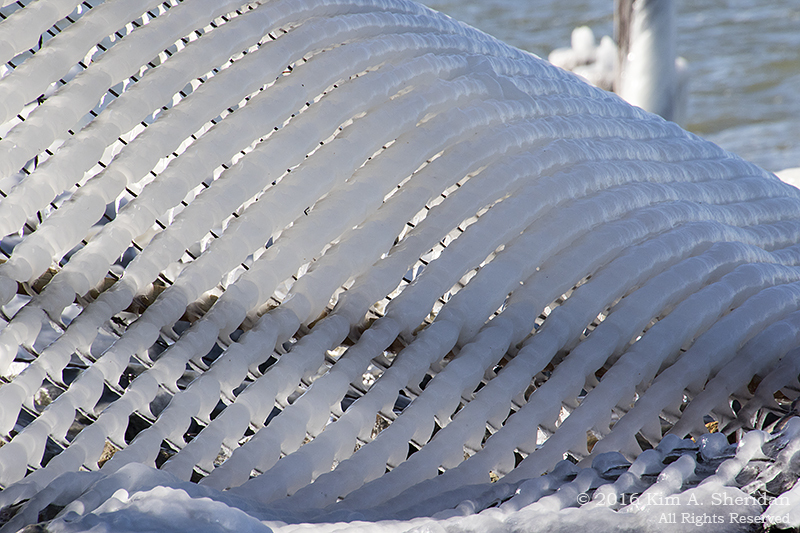 Nearby, a section of fallen chain-link fence arched gracefully to the ground, providing the framework for a fascinating ice abstraction. Robb and Don are always changing plans on the fly. I love it because I always get to see lots of different things when I’m with them. I don’t do spontaneity well. They push me to expand my horizons, while being endlessly patient as I adjust to stepping outside my comfort zone. Sometimes they move too quickly, though, and miss what’s right in front of them. 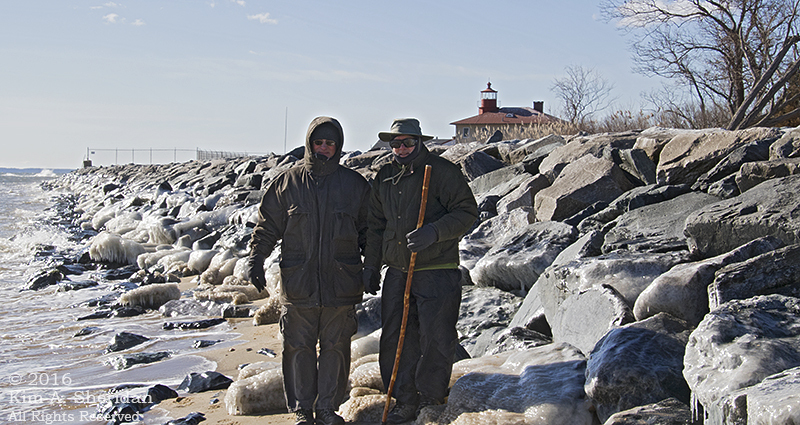 Cold as it was, they were keen to leave Point Lookout for our next destination. It took more than a little effort to convince them I’d spotted a neat beach to explore. My parents inspired a love of beach glass collecting many years ago. 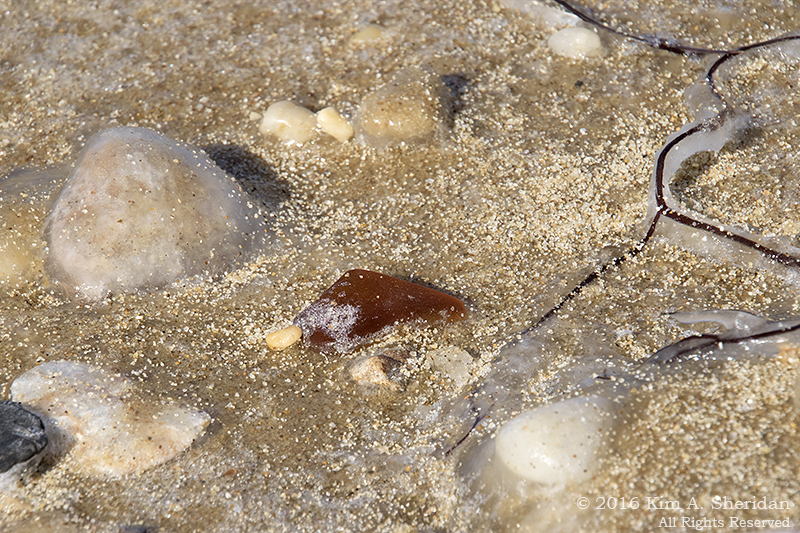 For a long time, that glass came exclusively from the Jersey Shore ocean beaches. Now I am collecting it in many other places – rivers, lakes, and bays. Point Lookout yielded several pieces of glass, my first from the Chesapeake Bay. This one wasn’t coming home with me, though. Couldn’t budge it. 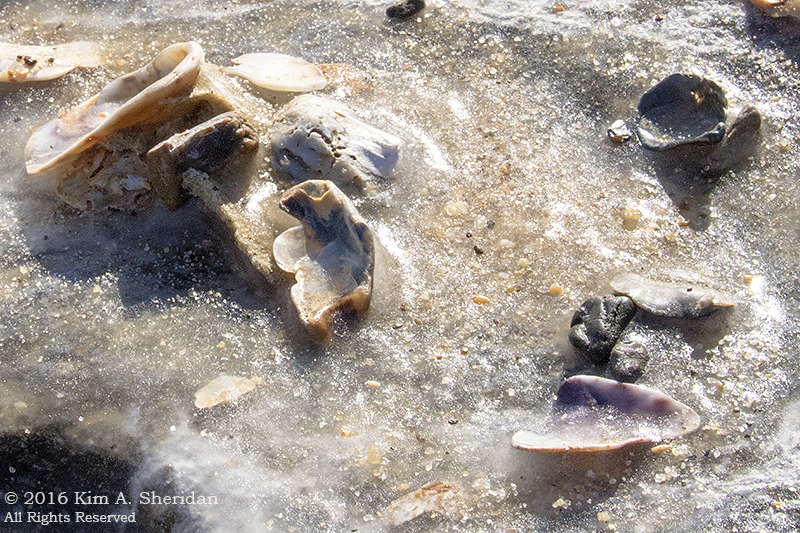 Ice on the half shell. 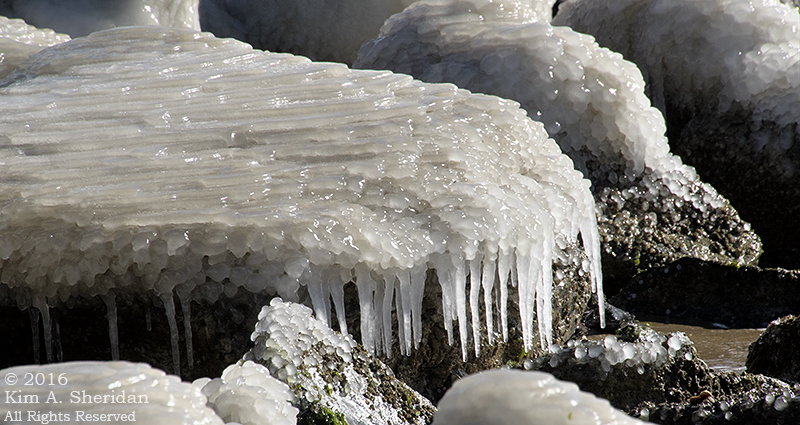 The rocks of the jetty formed a luscious confection, topped with terraced frosting that oozed into bubbles, then drizzled off the edges. 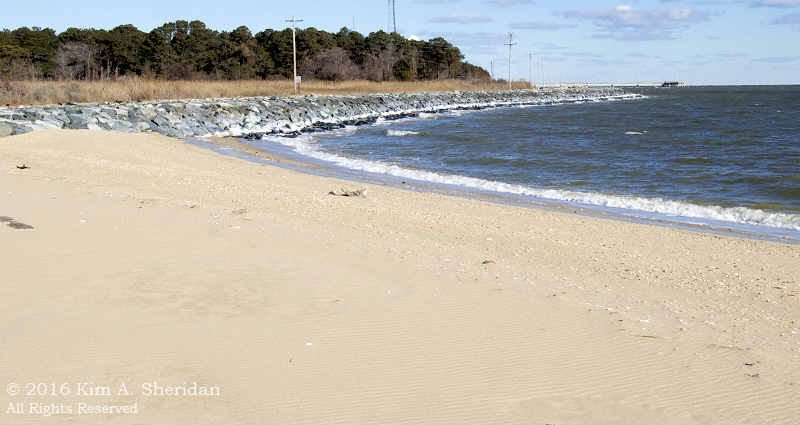 There were no fossils here, since we were south of the end of Calvert Cliffs. 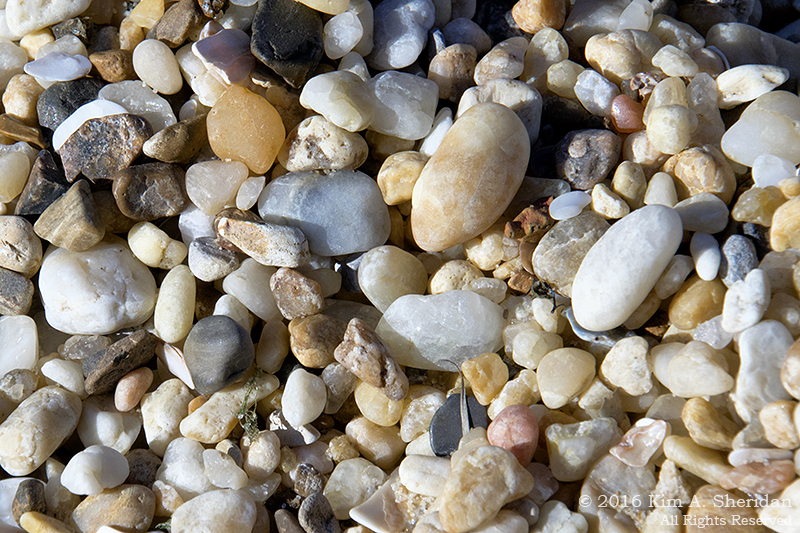 Instead, our focus was on pebbles. One of the things I love most about my friends is the variety and passion of their interests. Their enthusiasms change as quickly and as intensely as cloud formations in a summer thunderstorm. I am swept along with the gusts, learning along with them. And here they are, my frozen Valentines, bundled in parkas and balaclavas. Without them my Valentine’s Day might have been warmer, but not nearly so sweet. 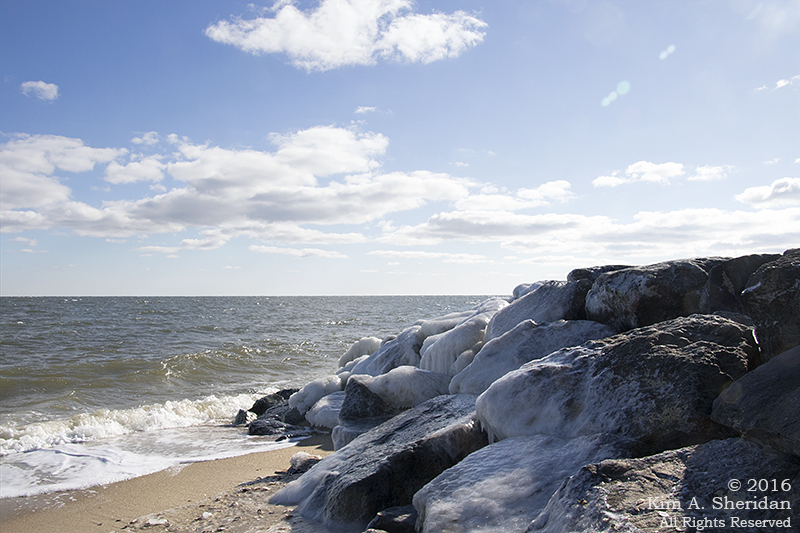 This entry was posted in Nature and tagged Chesapeake Bay, Nature, Point Lookout State Park by Kim. Bookmark the permalink.